Today I am not in a frame of mind to write about a recipe. Today is a kind of day when everything seems obsolete, every daily chore feels like a task. 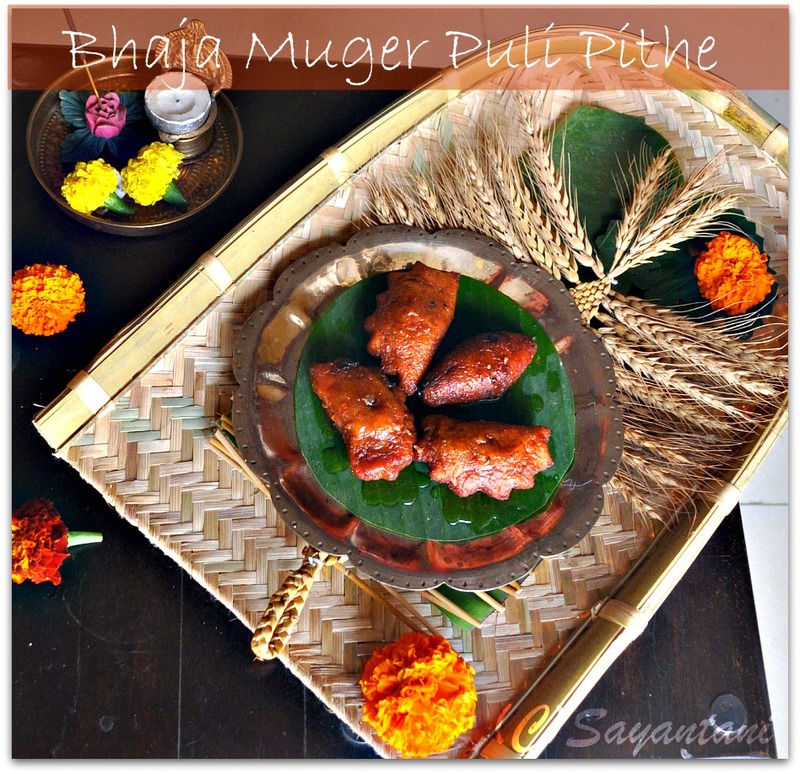 Still am making this post as I promised to many of my readers that I will help them making Muger Puli on Poush Sankranti. And to keep my promise I prepared it day before yesterday and clicked the pictures. So here it is. 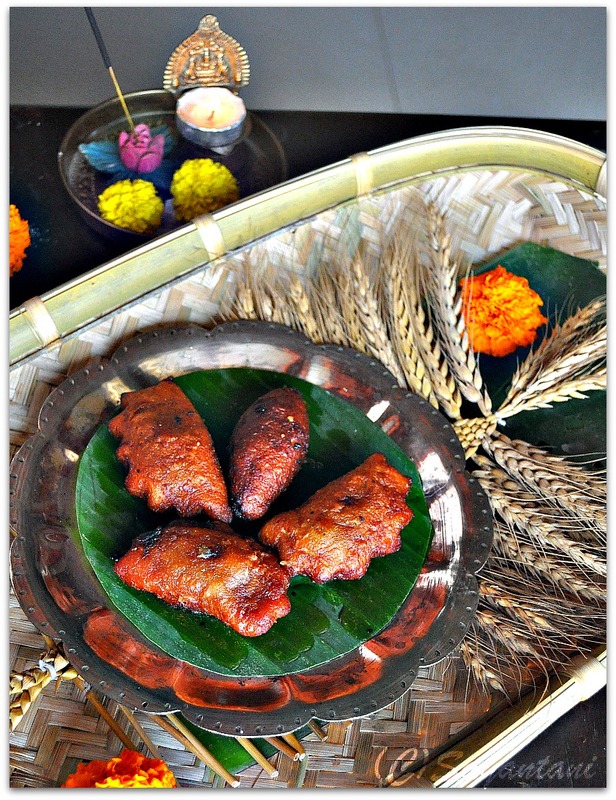 A traditional sweet made specially for Makar Sankranti or the Harvest festival. 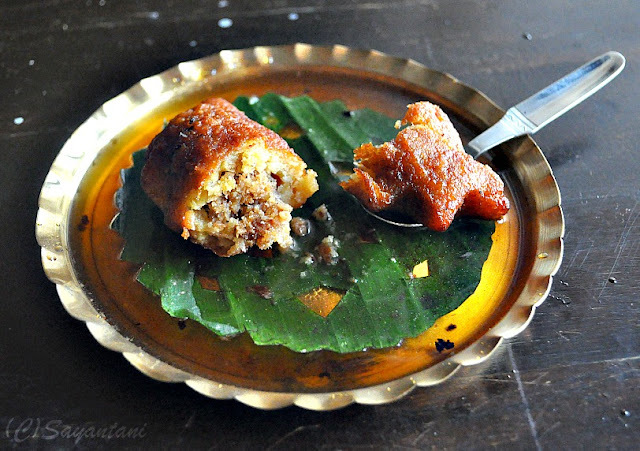 This is a stuffed sweet where the case is made with mashed yeallo lentil which is dry roasted and boiled with little water.the filling is made with scraped coconut, milk solids and date palm jaggery. 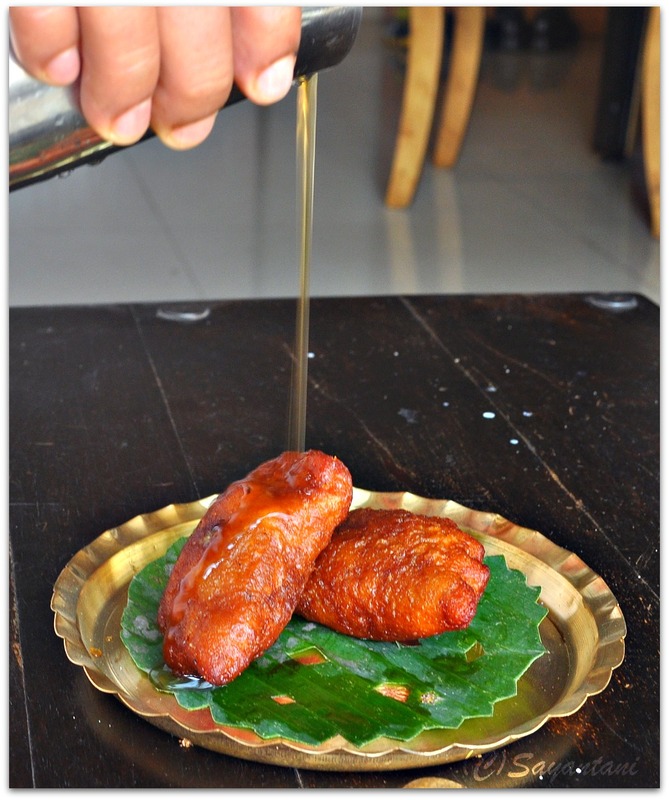 The half moon shaped sweets are then deep fried and soaked in date palm jaggery syrup. Enjoy the recipe and pardon me for not being able to write much. 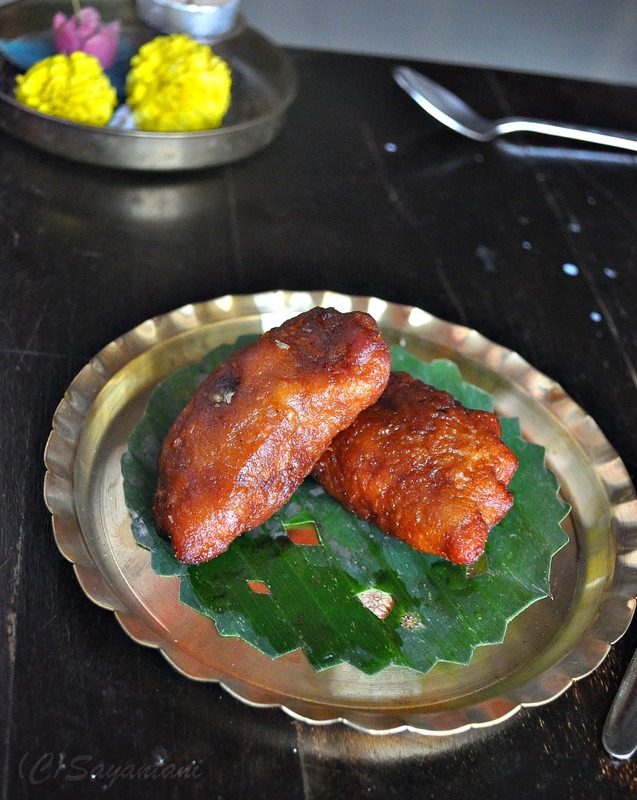 Mix in the date palm jaggery, scarped coconut in a heavy bottom or non-stick pan. Cook on low flame by stirring continuously. First a lot of juice will come out from the coconut. Let it all dry up by stirring and cooking for 7-9 minutes. When the coconut mixture starts to leave the sides of the pan add in the grated khoya and stir to combine all together. Take off from heat and let it cool. While it cools start dry roasting the mung dal by cooking it on low flame. Stir occasionally so that its cooked uniformly. This should take 5-7 minutes and when its done a beautiful roasted aroma should waft from the pan with the lentils turning a couple of shades darker. Wash this under running water and add 11/2 cups warm water. Cover and let it become soft. You may need some more water so always keep a cup of warm water ready at hand. The idea hear is to make the lentils soft and mushy without any extra water. Once done, cover and let it cool. In the mean time make the syrup by just boiling the ingredients for 5-6 minutes till they are little thick. Keep it warm. When the boiled lentil is cold, take it out on a plate and mash it. Add the rest of the ingredients i.e. flour, rice flour, salt. Soda and crushed cardamom powder. Knead to get a smooth yet tight dough just like roti’s or puri’s. Start making the puli or the half moon shapes by taking a golf ball size of dough. Press between your oiled palms and make a bowl by pressing it. Please refer to THIS. Fill the lentil bowls with a little (marble size) coconut filling. Bring the two edges together and press to secure the shape. Again refer to THIS. Repeat with the rest of the dough. You should get almost 12-14 pulis. Once all the pulis are prepared cover it and keep it aside. Heat oil in a heavy bottom pan. The amount of oil should be enough to cover the pulis (almost 3”). The oil should be very hot so that once anything is put in, it should sizzle and bubble and immediately come on top. The idea here is to immediately seal the outside of the puli or it will break. Trust me on this as I have been there, done that. Place one piece of puli and with the help of a spatula help to cook it on all sides. Once you see small brown spots on them place another one in the hot oil. Do not add many at one go as that wil decrease the temperature of the oil and the pulis fall apart. Once a puli is fried take it out with a slotted spatula and place in the warm syrup for a few seconds. Place in another bowl and repeat the process for the rest. Serve warm or cold with a spoonful of syrup drizzled on top. The temperature of the oil is very crucial. Bring it to almost smoking point and place one piece f sweet at a time. Making of this sweet takes up a lot of effort and if they get all mushed up during frying. If you don’t plan to serve them just after frying then don’t dip the fired pulis in syrup. They will become soft once you do so and storing them becomes difficult. Store the fried pulis in an airtight container in the fridge. Once you want to serve, warm them in microwave and dip in sugar syrup. Something very new to me... looks good.. I like that you post many traditional recipes that are not easy to find elsewhere on the Internet. Very beautiful presentation and lovely post! Mug daler bhaja ta dekhte darun hoyeche. Awesome photos. As usual tomar post er jonno w2at korte thaki. This sweet is something new to me, but it looks simply gorgeous and I would really love to try this. Ur pics are awesome!! Happy Makar Sankranti. This sounds and looks like a delicious dessert. Lovely presentation ! Hope you are in a better mood soon...Some days just get us off track ! Wow!! pithe dekte oshadharon hoyechhe.. BTW How are u?? Moong daler bhaja pithe dekhe khete icha korchhe. Darun hoyechhe..
Quite a new dish for me,looks simply irresistible. Looks really nice.. thanks for posting! I'm drooling, literally drooling, at your yummy pictures! Seasons Greetings, my friend! Wow, Love the pouring shot! I have no idea of this sweet, but looks absolutely delicious. very new to me, looks delicious..nice clicks.. Totally new recipe to me, sure to win the heart of everyone, very delicious. Happy Sankranti! and hope you are feeling better now. That is one painstaking sweet and you are very generous to go to that trouble to share with your readers! Its seems so delicious and surely it would be so. Sometimes its so hard to write...I totally understand :-).. This sweet is new to me. Thanks for sharing details about it. Puli pithe dekhe jibhe jol eshe gelo. Oshadharon hoyechhe. Dekhe r lobh shamlate parchhina r bhabchhi je tomar barite chole ashbo. I was away from blogosphere, health and the fact that I was missing Ma kept me away. I was glad to see your comment on my blog, gives me the strength to carry on, and kee dekhchi tomar ekhane , my favorite sweet Bhaja Pithe. Ektu mon kharab holo, mayer katha mone holo, she made it a point to make pithe every Sankranti. You are obviously very talented, I am no good at all this. I love the way you have made it and the effort you have taken in styling the dish. Not just this dish I have noticed that in all your dishes. this is brand new to me..interesting at the least! I am your newest follower..pls follow back if you can! Few days back i desperately wanted to cook bhaja pithe, gokul pithe.. but i didn't know the recipe. i also didn't want to wake ma up in wee hour of night. i went through your blog n i easily able to make all of them. thanks for sharing the recipes. Hi! this is Reema :) I am simply in love with your blog..far away from my in-laws..you have actually become my virtual mother-in-law teaching me all the difficult Bengali recipes which I always dreamt of making :) Thanks for sharing! Hi! :) I am simply in love with your blog..far away from my in-laws..you have actually become my virtual mother-in-law teaching me all the difficult Bengali recipes which I always dreamt of making :) Thanks for sharing!